It caused major disruption by reducing visibility and even penetrating indoor areas, far more severe than previous smog events experienced in the past, called "pea-soupers". Government medical reports in the following weeks, however, estimated that up until 8 December, 4,000 people had died as a direct result of the smog and 100,000 more were made ill by the smog's effects on the human respiratory tract. More recent research suggests that the total number of fatalities may have been considerably greater, one paper suggested about 6,000 more died in the following months as a result of the event. London had suffered since the 13th century from poor air quality, which worsened in the 1600s, but the Great Smog is known to be the worst air-pollution event in the history of the United Kingdom, and the most significant in terms of its effect on environmental research, government regulation, and public awareness of the relationship between air quality and health. It led to several changes in practices and regulations, including the Clean Air Act 1956. The cold weather preceding and during the Great Smog led Londoners to burn more coal than usual to keep themselves warm. Post-war domestic coal tended to be of a relatively low-grade, sulphurous variety (similar to lignite coal), while conversely, better-quality "hard" coals (such as anthracite coal) tended to be exported, which increased the amount of sulphur dioxide in the smoke. There were also numerous coal-fired power stations in the Greater London area, including Fulham, Battersea, Bankside, Greenwich and Kingston upon Thames, all of which added to the pollution. According to the UK's Met Office, the following pollutants were emitted each day during the smoggy period: 1,000 tonnes of smoke particles, 140 tonnes of hydrochloric acid, 14 tonnes of fluorine compounds, and 370 tonnes of sulphur dioxide which may have been converted to 800 tonnes of sulphuric acid. Research suggests that additional pollution-prevention systems fitted at Battersea may have worsened the air quality, reducing the output of soot at the cost of increased sulphur dioxide, though this is not certain. Additionally, there was pollution and smoke from vehicle exhaust—particularly from steam locomotives and diesel-fuelled buses, which had replaced the recently abandoned electric tram system – and from other industrial and commercial sources. On 4 December 1952, an anticyclone settled over a windless London, causing a temperature inversion with cold, stagnant air trapped under a layer (or "lid") of warm air. The resultant fog, mixed with smoke from home and industrial chimneys, particulates such as those from motor vehicle exhausts, and other pollutants such as sulphur dioxide, formed a persistent smog, which blanketed the capital the following day. The presence of tarry particles of soot gave the smog its yellow-black colour, hence the nickname "pea-souper". The absence of significant wind prevented its dispersal and allowed an unprecedented accumulation of pollutants. Although London was accustomed to heavy fogs, this one was denser and longer-lasting than any previous fog. Visibility was reduced to a few metres ("It's like you were blind") making driving difficult or impossible. Public transport ceased, apart from the London Underground, and the ambulance service stopped, forcing users to transport themselves to hospital. The smog was so dense that it even seeped indoors, resulting in cancellation or abandonment of concerts and film screenings as visibility decreased in large enclosed spaces, and stages and screens became harder to see from the seats. Outdoor sports events were also cancelled. In the inner London suburbs and away from town centres, there was no disturbance by moving traffic to thin out the dense fog in the back streets. The result was that visibility could be down to a metre or so in the daytime. Walking out of doors became a matter of shuffling one's feet to feel for potential obstacles such as road kerbs. This was made even worse at night since each back street lamp at the time was fitted with an incandescent light-bulb, which gave no penetrating light onto the pavement for pedestrians to see their feet, or even the lamp post. Fog-penetrating fluorescent lamps did not become widely available until later in the 1950s. "Smog masks" were worn by those who were able to purchase them from chemists. Near railway lines, on which "fog working" was implemented, loud explosions similar to a shotgun shot were common. The explosions were made by "detonators" – a form of large percussion cap placed on the track and activated by the wheels of trains. These devices were placed by certain signals to provide an audible warning to match the visual indication provided by the signal for the driver. There was no panic, as London was renowned for its fog. In the weeks that ensued, however, statistics compiled by medical services found that the fog had killed 4,000 people. Most of the victims were very young or elderly, or had pre-existing respiratory problems. In February 1953, Marcus Lipton suggested in the House of Commons that the fog had caused 6,000 deaths and that 25,000 more people had claimed sickness benefits in London during that period. Mortality remained elevated for months after the fog. A preliminary report, never finalised, blamed those deaths on an influenza epidemic. Emerging evidence revealed that only a fraction of the deaths could be from influenza. Most of the deaths were caused by respiratory tract infections, from hypoxia and as a result of mechanical obstruction of the air passages by pus arising from lung infections caused by the smog. The lung infections were mainly bronchopneumonia or acute purulent bronchitis superimposed upon chronic bronchitis. Atmospheric scientists at Texas A&M University investigating the haze of polluted air in Beijing realized their research led to a possible cause for the London event in 1952. "By examining conditions in China and experimenting in a lab, the scientists suggest that a combination of weather patterns and chemistry could have caused London fog to turn into a haze of concentrated sulfuric acid." Even though research findings point in this direction, the two events are not identical. In China, the combination of nitrogen dioxide and sulfur dioxide, both produced by burning coal, with a humid atmosphere, created sulfates while building up acidic conditions that, left unchanged, would have stalled the reaction. However, ammonia from agricultural activity neutralized the acid allowing sulfate production to continue. 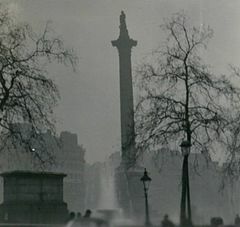 It is theorised that in 1952 in London, the nitrogen dioxide and sulfur dioxide combined with fog rather than humidity; larger droplets of water diluted the acid products, allowing more sulfate production as sulfuric acid. Sunrise burned off the fog, leaving concentrated acid droplets that killed citizens. ^ "The lethal effects of London fog". BBC News. 22 December 2015. ^ "In 1952 London, 12,000 people died from smog — here's why that matters now". The Verge. 16 December 2017. ^ Brimblecombe, Peter (1976). "Attitudes and Responses Towards Air Pollution in Medieval England". Journal of the Air Pollution Control Association. 26 (10): 941–45. doi:10.1080/00022470.1976.10470341. ^ McKie, Robin & Townsend, Mark. Great Smog is history, but foul air still kills (The Observer, 24 November 2002). ^ "The Great Smog of 1952". metoffice.gov.uk. Archived from the original on 3 September 2014. Retrieved 12 October 2014. ^ a b Mason, Nigel; Hughes, Peter (2001). Introduction to Environmental Physics. CRC Press. pp. 112–13. ISBN 978-0748407651. ^ "Atmosphere, Climate & Environment Information Programme". Ace.mmu.ac.uk. 4 December 1952. Archived from the original on 25 February 2009. Retrieved 30 June 2010. ^ "Met Office Education: Teens – Case Studies – The Great Smog". Metoffice.gov.uk. Archived from the original on 5 June 2011. Retrieved 30 June 2010. ^ Greater London Authority. 50 Years On: The struggle for air quality in London since the great smog of December 1952. ^ Nielson, John. "The Killer Fog of '52". NPR. Retrieved 14 December 2013. ^ "London fog clears after days of chaos". BBC News. Retrieved 7 December 2014. ^ "The Great Smog of 1952". metoffice.gov.uk. Retrieved 17 August 2008. ^ "Coal: Nutty slack". Commons Sitting of 16 February 1953. hansard.millbanksystems.com. ^ Davis DL. 2002. When Smoke Ran Like Water. New York:Basic Books. ^ Hunt, Andrew; Abraham, Jerrold L; Judson, Bret; Berry, Colin L (2003). "Toxicologic and epidemiologic clues from the characterization of the 1952 London smog fine particulate matter in archival autopsy lung tissues". Environmental Health Perspectives. 111 (9): 1209–14. doi:10.1289/ehp.6114. PMC 1241576. PMID 12842775. ^ Bell ML, Davis D. 2001. Reassessment of the lethal London fog of 1952: novel indicators of acute and chronic consequences of acute exposure to air pollution. Environ Health Perspect 109(suppl 3):389–94. ^ Camps, Francis E (Ed.) (1976). Gradwohl's Legal Medicine (Bristol: John Wright & Sons Ltd, 3rd ed.) ISBN 0-7236-0310-3. p. 236. ^ Andrew; Abraham, Jerrold L.; Judson, Bret; Berry, Colin L. (2003). "Toxicologic and Epidemiologic Clues from the Characterization of the 1952 London Smog Fine Particulate Matter in Archival Autopsy Lung Tissues Hunt". Environmental Health Perspectives. 111 (9): 1209–14. doi:10.1289/ehp.6114. PMC 1241576. PMID 12842775. ^ Stone, R (2002). "Counting the Cost of London's Killer Smog". Science. 298 (5601): 2106–07. doi:10.1126/science.298.5601.2106b. PMID 12481106. ^ "Choking fog spreads across Britain". BBC News. Retrieved 16 January 2015. ^ Domonoske, Camila (23 November 2016). "Research On Chinese Haze Helps Crack Mystery of London's Deadly 1952 Fog". NPR. Retrieved 23 November 2016. Bell, Michelle L.; Davis, Devra Lee (June 2001). "Reassessment of the Lethal London Fog of 1952: Novel Indicators of Acute and Chronic Consequences of Acute Exposure to Air Pollution". Environmental Health Perspectives. 109 (Suppl 3): 389–394. doi:10.2307/3434786. JSTOR 3434786. PMC 1240556.